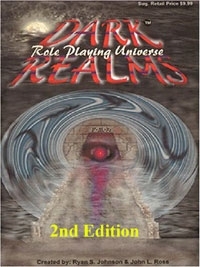 The Dark Realms Role Playing Universe first saw print in early 1998. Now 6 years and two print runs later, the Guild has decided the Dark Realms will live again as an e-product. As such, we have upgraded some of the art and editing and did all new layouts to present you with a much nicer looking and more complete Dark Realms 2nd Edition. The Dark Realms is a fantasy RPG designed for the true role players; providing a unique results system empowering the Realm Master with the ability to keep his/her players in the dark regarding dice rolls and the potenecy of their encounters. Whereas with many systems players can tell much about an encounter based in the dice being rolled, or target numbers that need to be achieved on a given dice. With the Dark Realms unique Results Table, all random results from rolling a character's attributes, to combat results, spell casting, present the players and Realm Master with ever changing target numbers, with 'good' or 'bad' varying across the entire D12 spectrum. The pearl of the Dark Realms system is its fluid rules for character Skills and Spell Casting. In the Dark Realms players do not learn a 'skill' or 'Spell', but rather learn much broader areas of knowledge, leaving players to create unique applications of that knowledge during game play. For instance, a character doesn't learn a 'Fire Ball Spell', but rather simply learns the Spell Field of fire. With it, a player may attempt any mysticism based upon fire, with success, failure, and effect being based on the difficulty of the exact applications the players come up with and the skill level the character has with the Spell Field of fire. In this manner, there really are no "spells", just hundreds if not thousands of unique and specific things the players may attempt with their knowledge/talent. Ken Filewood 7 5 4 Well enough written, presented, organised. The game is pretty standard old-style RPG, but with a kind of CRT for combat.